Kids’ birthday parties are great fun to watch and experience. You can see the immense joy on your kid’s face when everyone sings, and he\she blows the candle. To capture these moments and to remember this special occasion capturing good photos is important. Each birthday is a milestone, and it’s a treasure you will want to look back with fond memories. To capture those funny, tender and joyful moments on photos is difficult for you when compared to professional birthday photographers. Here are a few tips that can help you. Pics of prep: First birthday photographers suggest that you take pics of the preparation of the party and the party space. After the venue is decorated and is ready to get visitors its the best time to get some clicks. Many parents prefer to dress the kid in party wear and take pics of the venue before everyone arrives but ensure you don’t tire the kid too much. If you have multiple dresses, you can take pics of the kid in that wear a few days before the event so that your child is not stressed out opines photographers for birthday parties in Chennai. Go low down and get up high: The kids are little so you will want to get down low to get some exciting photos. You may have to sit, kneel down or even get onto your belly to click them playing or enjoying the party. It is also a good idea to get some overhead shots of everyone at the party. It will be an excellent addition to the album opines birthday photographers in Chennai. You can stand on a table or a chair to get an overview. Don’t forget to get in: Most often it is seen that the parent clicking the photos is missing, so ensure that you are also in the family picture. 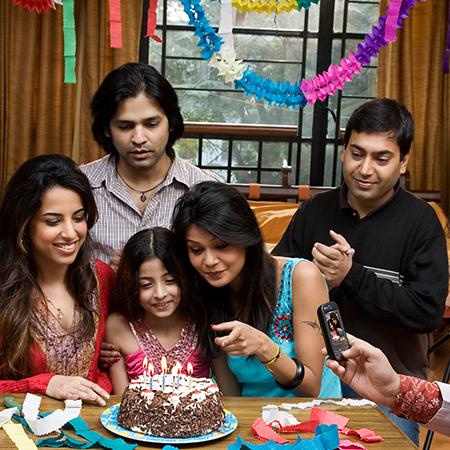 Ask your friend or someone to take pictures of you along with your family so that you are also part of the album. Close up pictures: It is essential to get some up-close photos of your baby and everyone else in the party. Having close-up images along with wide-view ones will add more variety to your photo book. You can also send thank you emails with their up-close image; you can also recall all the fond memories of all the friends you and your child had at the first birthday. Shoot other things too: The first birthday party is not just about the people but also about the effort into decorating the party space. Best birthday photography insist that you should take shots of all the props that give the feeling of the first birthday party. It can also include the food, gifts that are placed on the table, balloons on the floor. A close-up shot of the cake with and without the baby, party banner all make for a good cover photo. Your child’s first birthday party is excellent fun but ensure you don’t spend all the time taking photos. Enjoy the party, have fun with your kid and if you are always behind the camera you child may get cranky and start crying. So have a good time and enjoy the party.